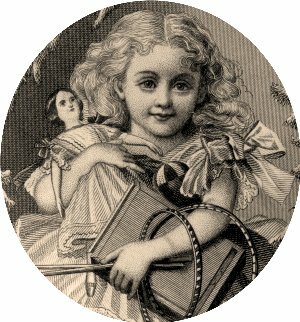 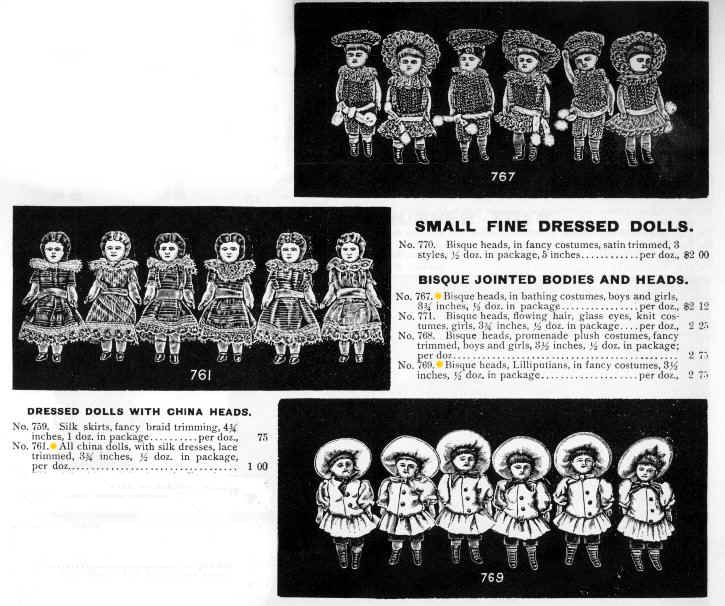 Dolls for dollhouses were not usually identified as such in old catalogues. 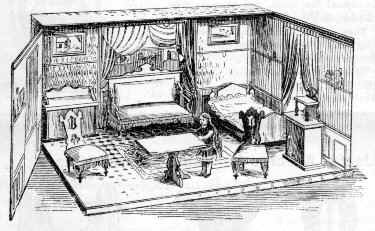 One has to check the sizes to see if they would fit into what was often a 1:12 scale house while keeping in mind children were tolerant of some inconsistency in scale. 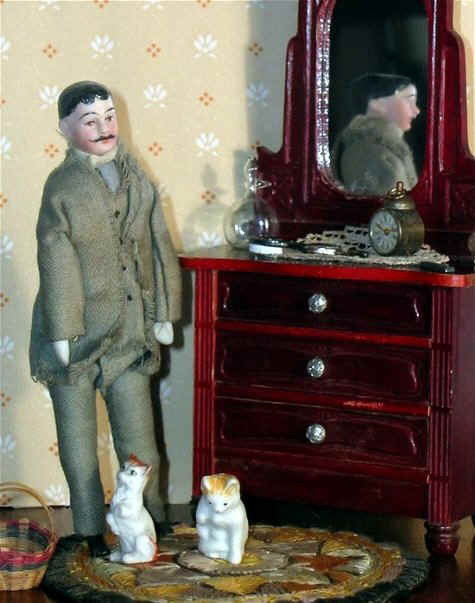 Even if, theoretically, a 6 inch male doll represents a six-foot man or a 5½ inch female doll a 5½ foot woman, dolls representing children but still able to fit into miniature rooms were likely accep table, even if on too large a scale. 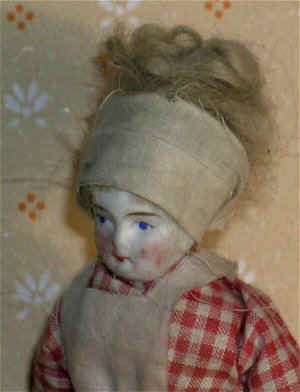 The larger tin kitchens and iron cook stoves, used independantly of dollhouses, would have needed taller dolls. 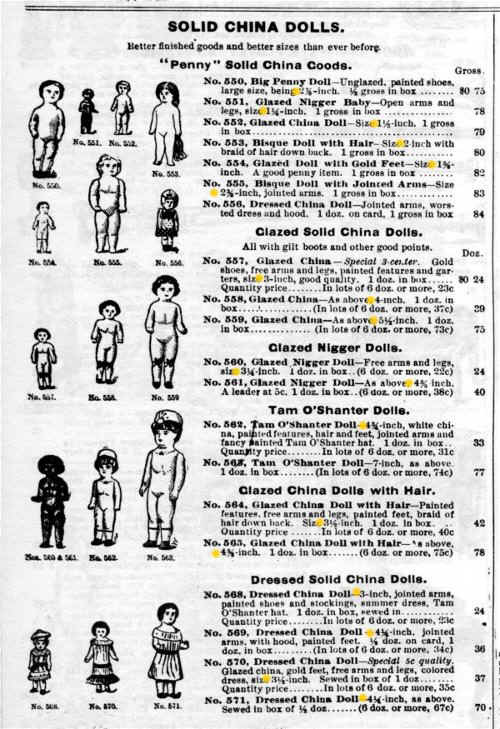 In the catalogues reproduced below from the 1880s to 1920s, adult dolls under 6½ inches (and baby dolls under 4½") are singled out and marked with a yellow dot if mixed in with larger dolls. 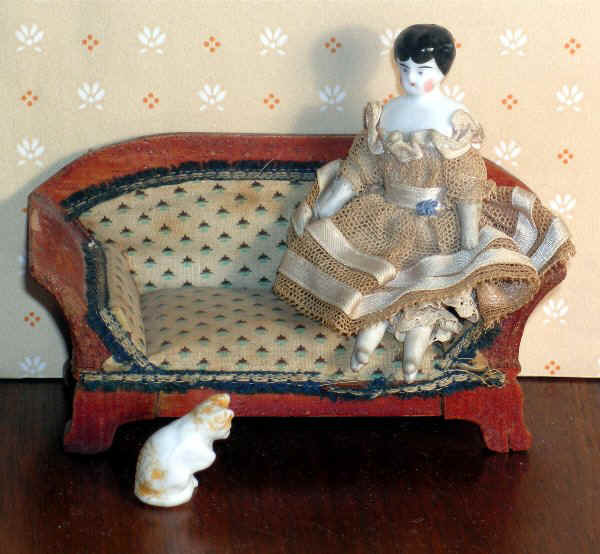 Dollhouse dolls may simply be smaller versions of a certain line of dolls, although some also were simplified in detailing. 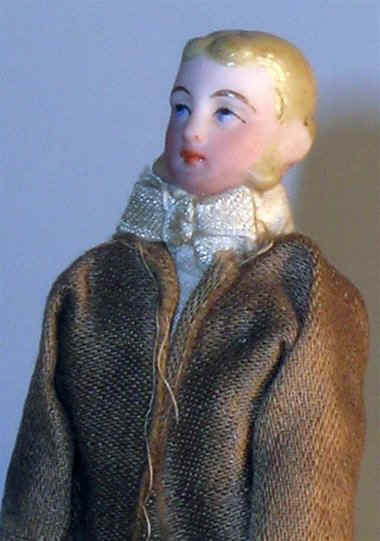 One could buy -- in addition to assembled dolls -- separate heads, arms, legs and bodies to sew together at home and then dress with home-made clothes. 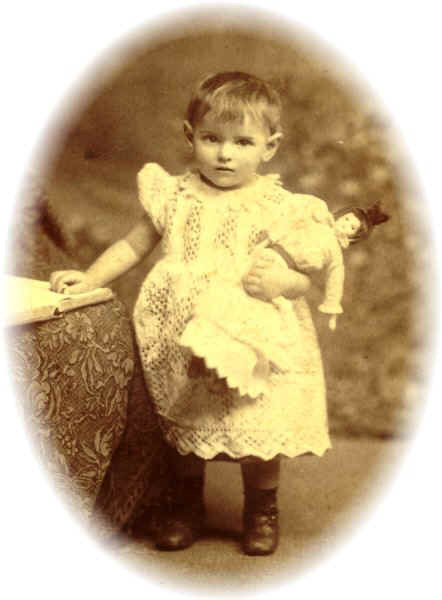 Babies and children were particularly popular toys in the early 20th century. 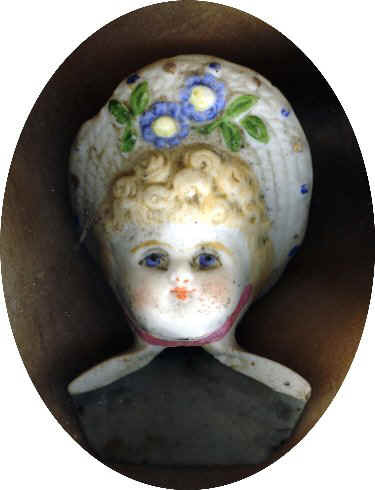 This appealling glazed china doll, 5 inches high (as is), has sadly lost her extremities but the lack of original clothes allows us to see the fabric covered body, stuffed with wood shavings, to which the china head and shoulder plate, lower arms (and hands!) 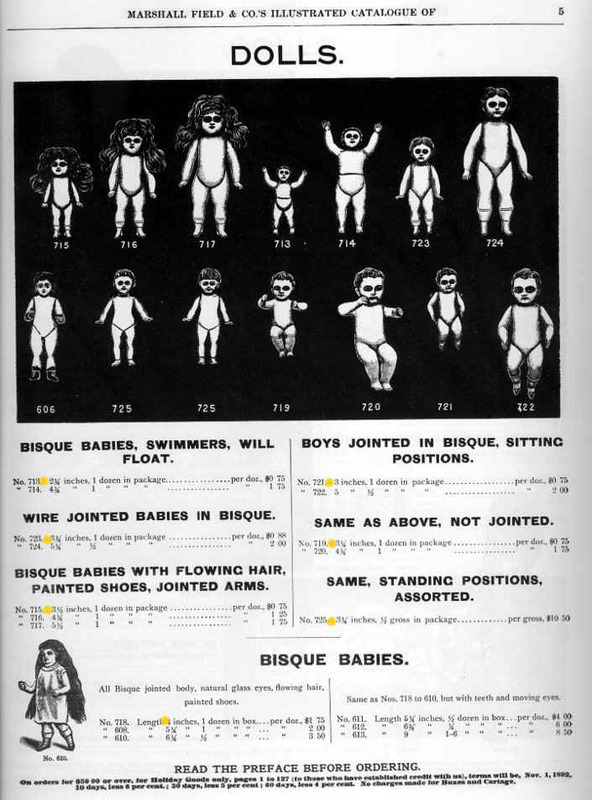 and lower legs (and feet!) 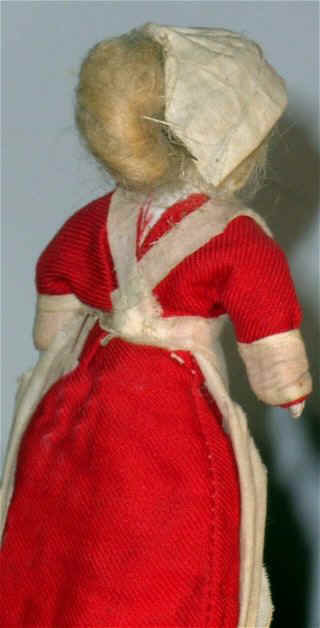 were attached. 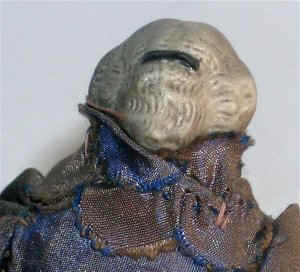 The thin areas on the uppermost part of the arms allow them to bend, and the stitching across the pelvis allows flexibility for the legs. 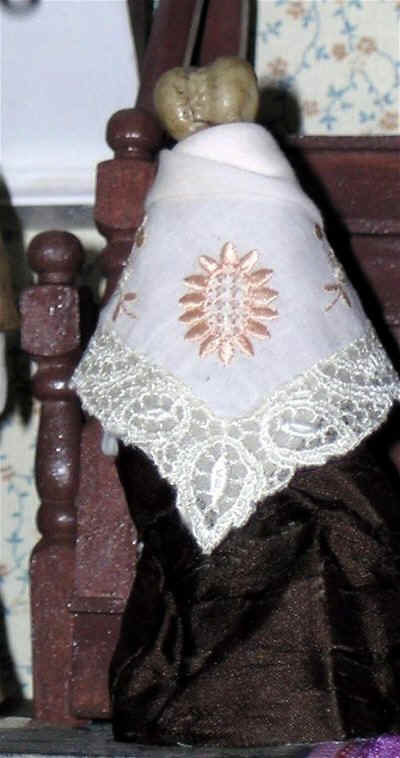 Fabric continues over the china shoulder plate to the neck but this is unusual. 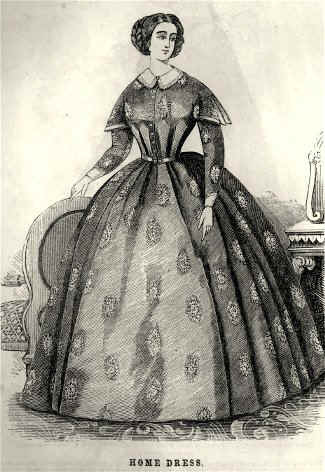 The waist is nipped in and the hips wide in the fashion of the 1860s to suit the style of dress then in vogue (above). 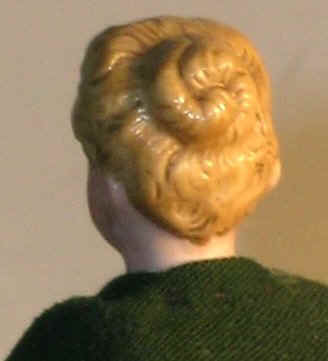 The hair style also reflects this date with a centre part and the hair smooth until forming heavy curls around the face and back of the neck. 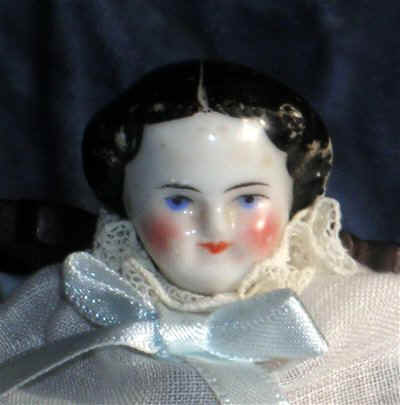 The full face has large eyes and a small rosebud mouth. 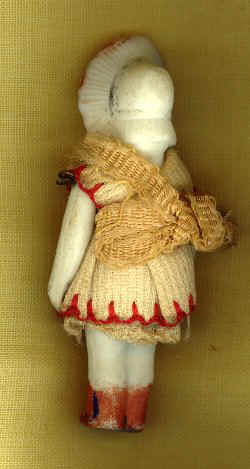 Until about this time, shoes on dolls were flat, whereas after or even during the 1860s, shoes with heels were popular. 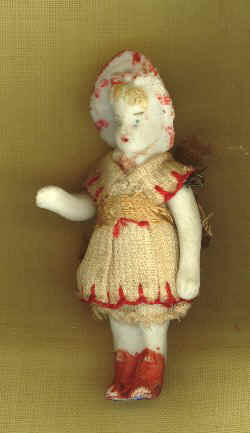 With a doll this damaged, the best thing you can do is to put her to bed. 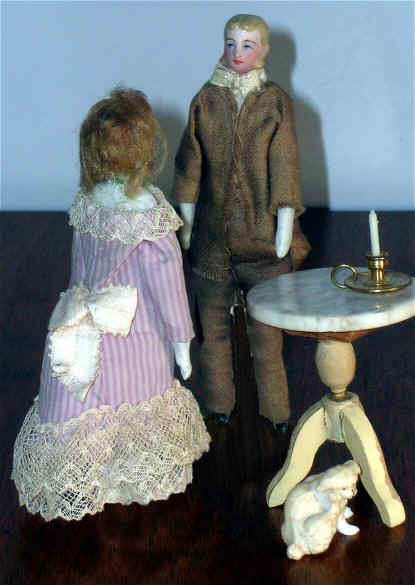 1870s above A pair* of tinted bisque dolls representing an elderly couple: the man with a balding head, furrowed brow and wrinking around his eyes while the woman with her grey hair has wrinkles on her forehead and a downward turned mouth. 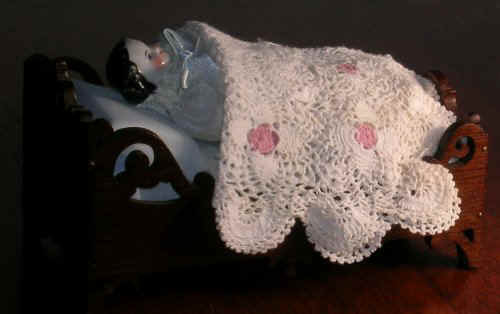 The signs of aging are achieved by painting details on pink skin. 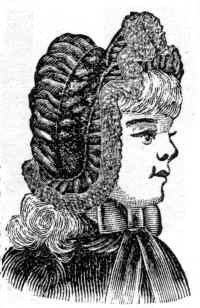 Her hair is parted in the middle, full at the sides and caught in a loose bun by a black bow. 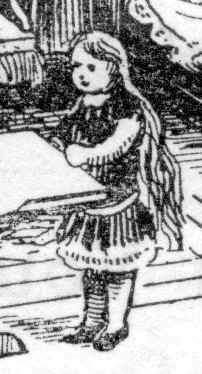 Her little feet are in black boots with heels. 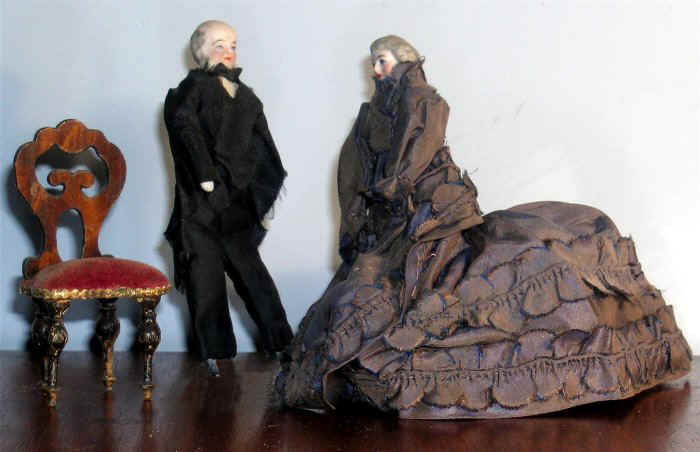 All hand stitched, her grey-blue silk dress is spectacular with ruffles and a large train in the style of the 1870s. 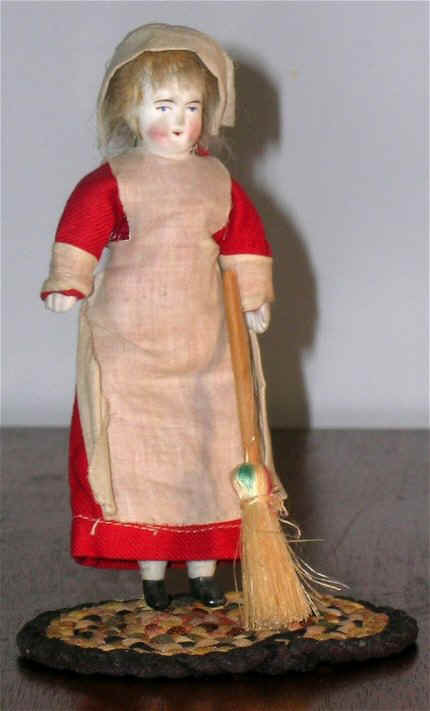 Its volume permits her to stand without a prop. 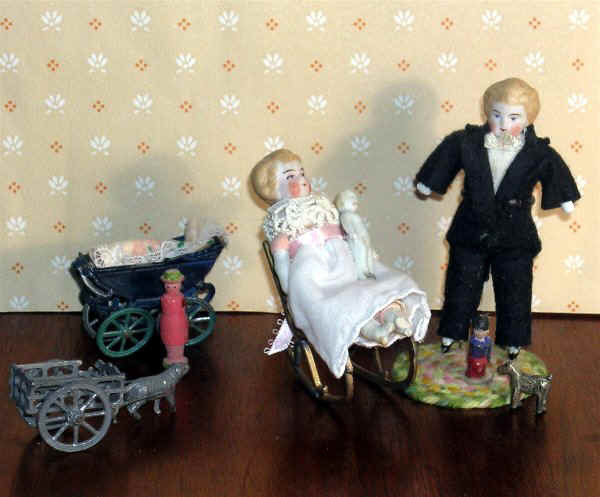 Only 5 inches tall, this couple is a tribute to the skill in moulding, assembling, painting and dressing-making of 19th-century German doll makers. 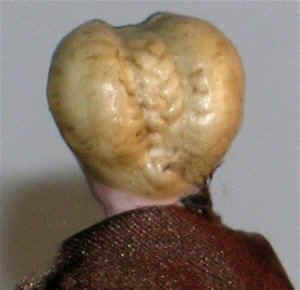 Young woman* with a black bow in her blonde hair, which has a braid in the centre of the back of her head. 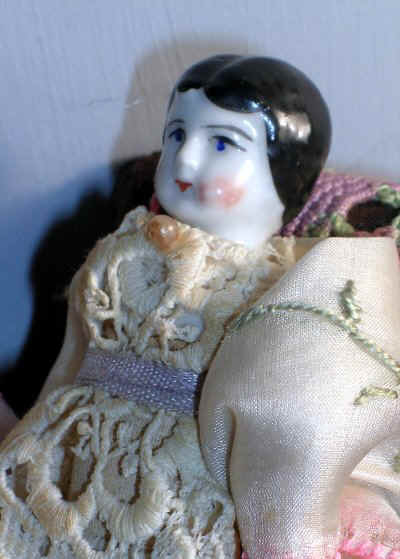 Her beautiful silk dress in russet brown with beads is disintegrating. 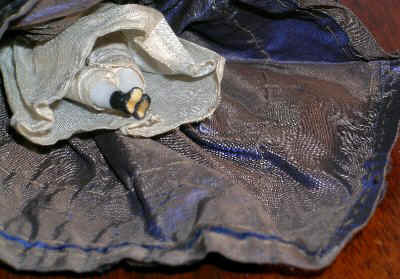 A shawl (antique handkerchief) helps hid the damage. 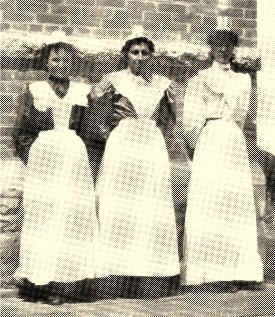 * This more comfortable dress is part of the aesthetic movement in an attempt to reform the artificial nature of the 1880s and '90s fashion with its call for stays, corsets, added bustle forms, ribbons and lace. 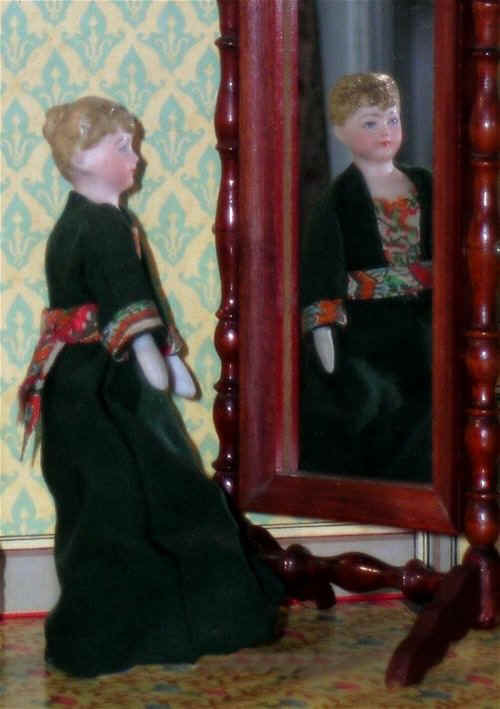 The dark green effectively contrasts with the brilliant and varied colours of the inset bodice, arm edging and waist tie. 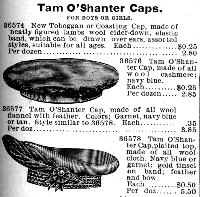 Freedom of movement can be achieved due to the soft material and loose fit. 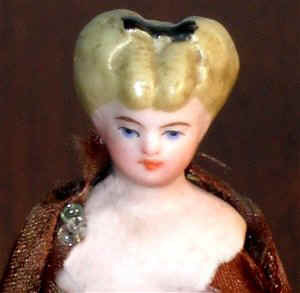 Long hair pulled into a bun was easier to manage than the over-coiffed hair styles in vogue. 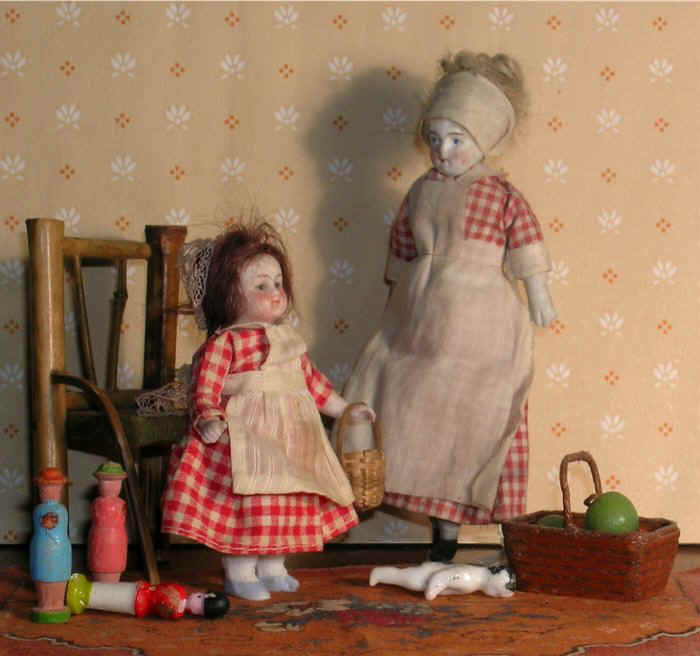 Maid* and child; the simple gingham dress, cap and apron speak to the status of servant; her face is white with painted details on untinted bisque, whereas the family members have pink skins but there is a similar use of a cloth stuffed body attached to china lower arms and hands, as well as tiny lower limbs and feet; her dress is hand worked like those of the family. 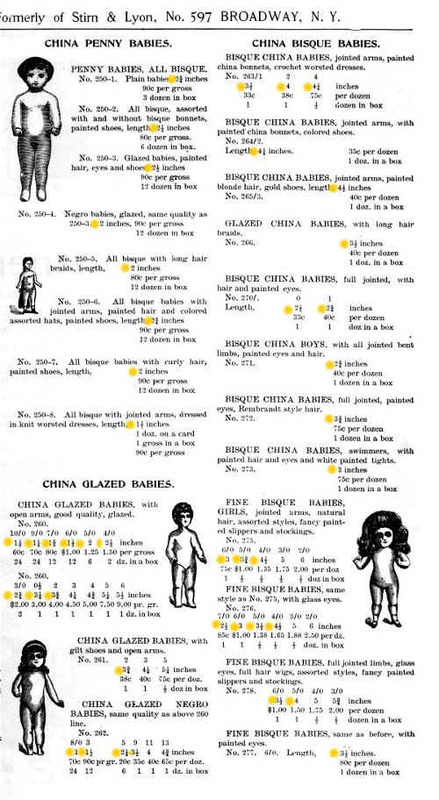 A major difference is the natural wig unlike the moulded hair of the family. 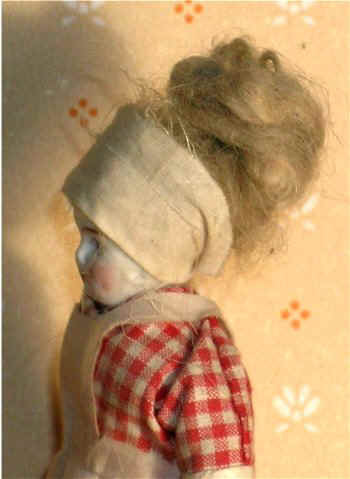 Perhaps she was acquired from different dollmaker. 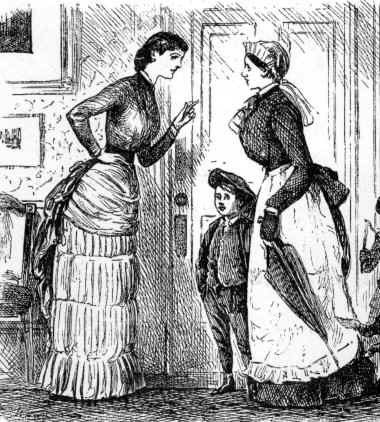 In this drawing of 1884 from Pictures of English Society, the mistress is in a formal dress with pleats and a fashionable bustle, while the maid has a cap and apron over a simpler dress. 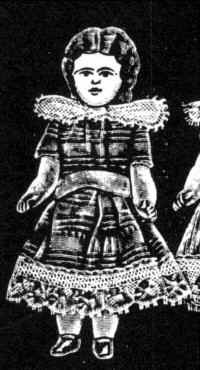 The little girl (3½" high) has the same outfit but recently was purchased from a different source. 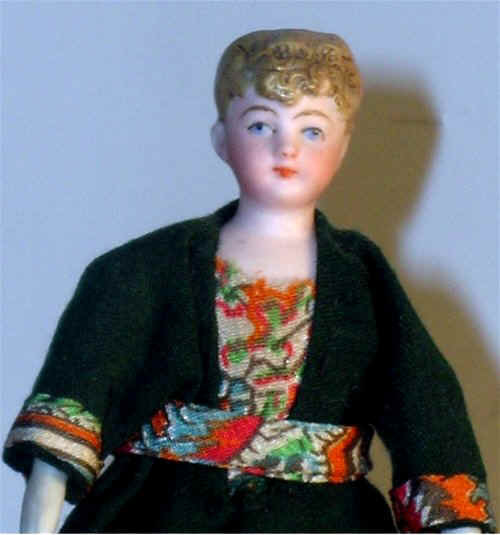 She has machine stitching in her outfit and a glaze on her painted features. 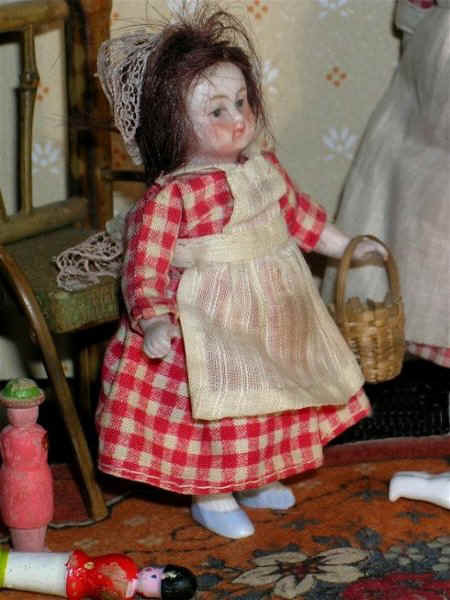 Her solid bisque body, substantial legs and feet and ability to be self-supporting suggest a date in the late 19th to early 20th centuries. 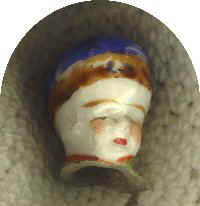 Her unruly brown hair comes out of a hole on the top of her head. 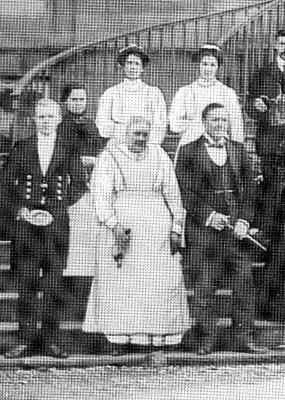 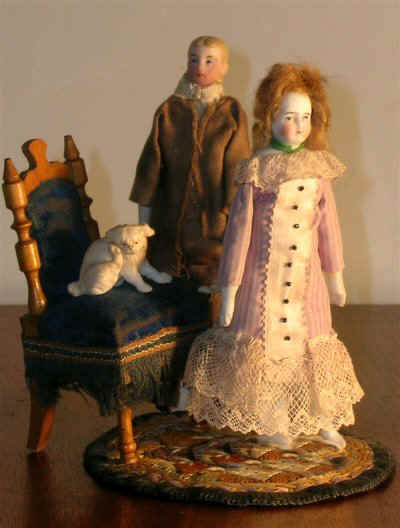 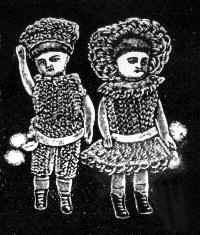 Brother and sister, untinted bisque with moulded blonde hair, 3¾" high; the boy in original felt suit but the girl has a replacement dress over an original petticoat. 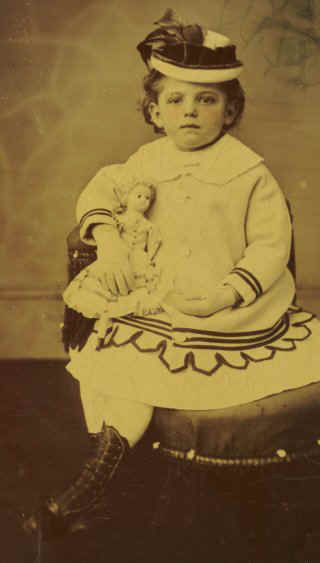 Her stuffed body is covered in pink cloth, to which white lower legs and boots are attached; the boy has black detailing on his boots. 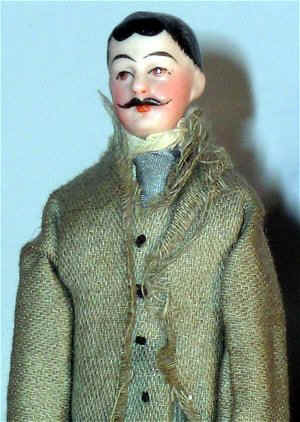 They have the same moulded head and hair, although the hand-painted details show variations. 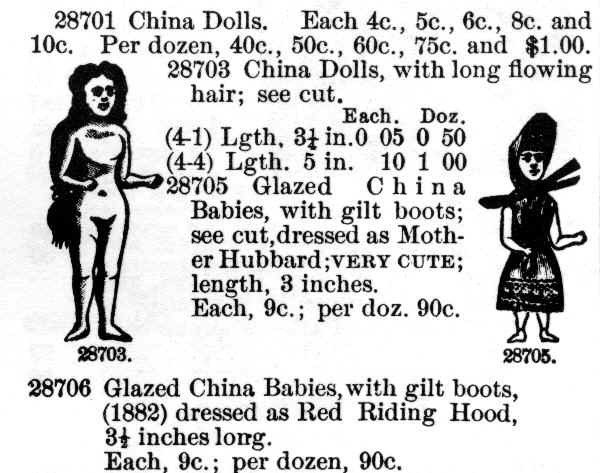 Dolls with stuffed cloth bodies and glazed china heads with painted hair continued throughout the 19th century and into the early 20th but, generally speaking, the body itself was made out of china in many dollhouse dolls after the 1890s, as shown in the catalogue pages below. 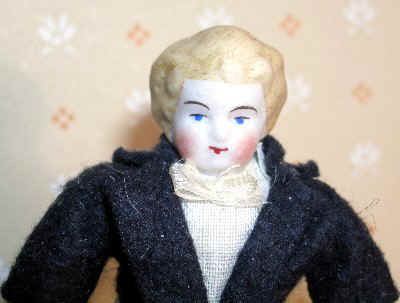 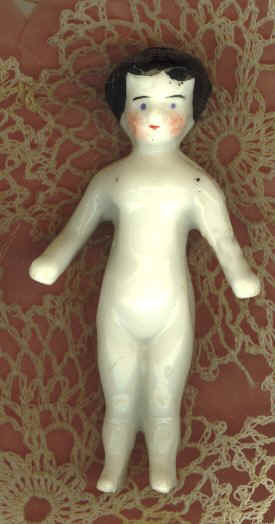 (note: In the 1970s, dolls with bisque or glazed china heads and stuffed bodies were reproduced for children and adult miniature collectors as props in "antique" settings.) 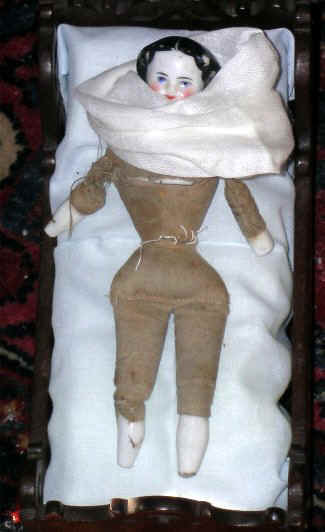 The doll on the left (above), 5½" high, has an early head placed on a reproduction body with recent clothes (the shawl and skirt are antique handkerchiefs). 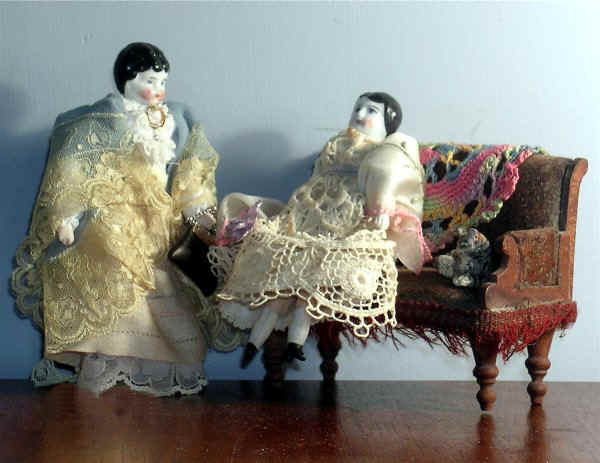 The doll on the right (above and in the detail on the right) has her original body and clothing -- a lace dress with a bead ornament near the throat, purple waist-sash and attached full rose on the skirt. 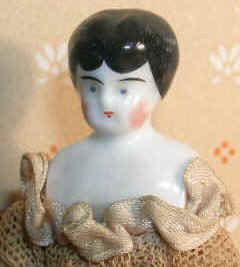 The modelling of the hair is minimal, relying more on black paint for definition. 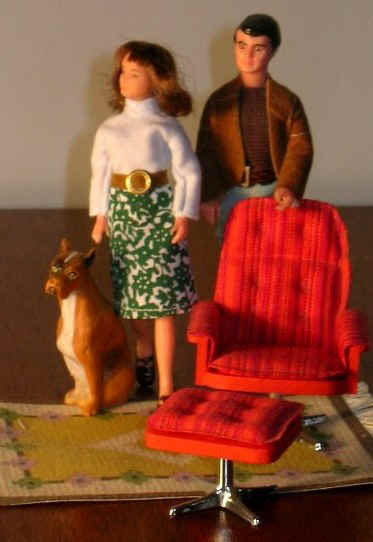 Feet are still relatively tiny and with heels. 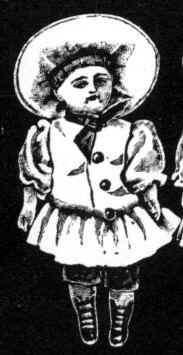 The doll below has a low-cut original dress of netting and ribbon with cotton and lace pantaloons and petticoat. 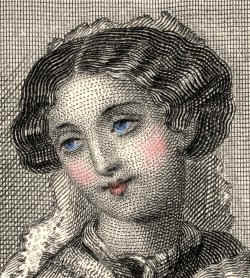 Only 3¾" high, her diminutive face was likely difficult to paint; at any rate, it is a simplistic rendition. 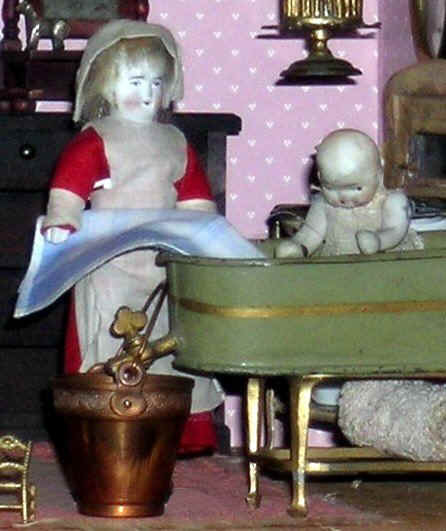 Her proportions suggest a young woman meaning that the scale is a reduced one; in general, children and babies become more prevalent about 1900.
detail of dressed china doll with real hair in bed/sitting room, 14½" x 10"
left & right bisque doll with moulded bonnet, original fabric dress, sash and petticoat, painted detailing including boots, jointed arms, just under 2"
right solid bisque doll with moulded bonnet, 2½"